Do you have picky kids? Picky husband? 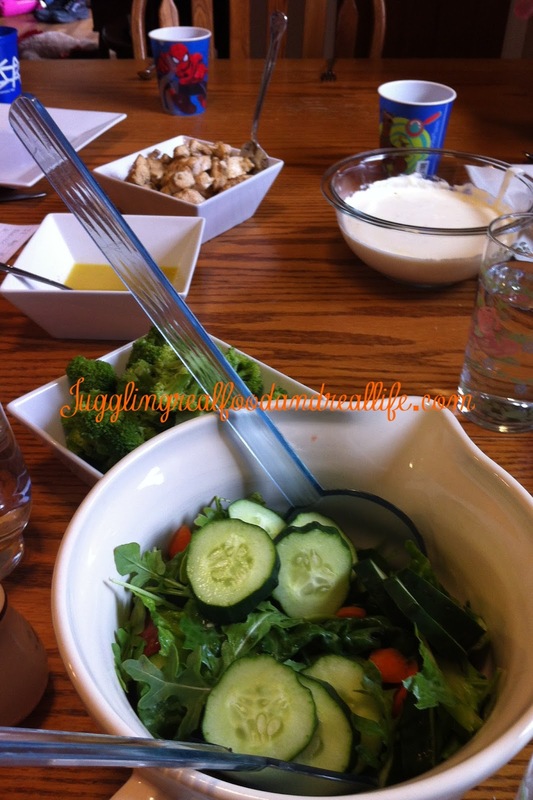 Are you a picky eater? We all have foods we like and foods we don’t like. I don’t like to be a short-order cook so I strive to make meals that the majority of my family will happily eat. Remember,…….I’m still trying to convince them that Real Food tastes better than processed food. One strategy I use is my “taco strategy”. I seek out foods that I can make for everyone that can be customized by the individual family member. When I make tacos, I lay out all of the meat, cheese, vegetables, and other various toppings and everyone makes their own. You can apply this concept to sandwiches or the fancier paninis. It also works with omelets and now with pasta. I came up with the idea after going to a fancy party. I define fancy party as “Hooray! It’s just for grown-ups.” There were stations of food and each station had a theme. One of those themes was pasta and I was able to walk up and choose the pasta, sauce and toppings I wanted. As long as I don’t have to cook twice, I don’t mind my family having slightly different versions of food on their plate. In fact, my mother-in-law and I were just talking at little C’s baseball game about just how picky my little guy is and we both agreed that it really is OK, as long as all the food he eats is healthy. Since I also live with Mr. Carnivore and Miss Sometimes Vegetarian, meal planning can be tricky. This really worked for us, so you may want to give it a try. My oldest son’s favorite meal is Broccoli Chicken Alfredo. I was eager to make this for him when he came home from college and try out my new pasta bar idea. He and I prefer everything mixed together, but agreed that the pasta bar really worked for the rest of the family. Here is how I put it together. I wish I had a better picture of the finished pasta bar, but you’ll get the idea. 3 Organic Chicken Breasts chopped into bite-sized pieces. Additional Parmesan Cheese for topping. Optional: Chopped Mushrooms or any of your favorite vegetables. with salt. I saw an episode of "Chopped" and the chef got chopped because he didn't salt his chicken. Don't let this be you. 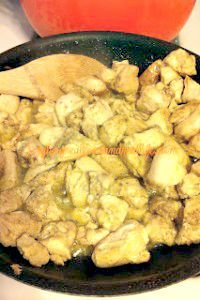 Cook chicken over medium high heat in a little bit of olive or coconut oil. Blanche broccoli in boiling water until fork tender. Cook Whole Wheat Pasta following the directions on the box. Juggling Tip: If trying to convert to whole wheat pasta, you may want to cook it a minute or two longer than the directions state. Whole wheat pasta is firmer than regular pasta so cooking it longer gives it more of a similar texture. 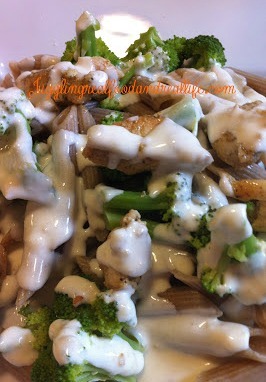 Place Alfredo Sauce, Pasta, Broccoli, Cooked Chicken and any other toppings into bowls and allow your family to create their favorite combination. Sit back and relax because everyone will be happy. The conversation is also great as everyone gets to show off their individual creations. This is a very subtle way to teach your children the joy of preparing food. Now it’s your turn……….I’ve talked enough. Do you ever use the “taco strategy”? What are ways you cook for your family without being a short-order cook? How do you balance exposing your children to new food without starving them to death? I would like for my two picky ones to eat more of a variety, but I've made peace with it for now. I figure as long as everything they put in their body is healthy, then I'm not going to worry about the variety. I always offer, but I don't make a big deal of it if they decline. The stress is too much for me and I prefer a peaceful, loving dinner table. Just stopping by to say thanks for the follow on Bloglovin'; appreciate it! I'm happy to be following you back :o) Hope you had a wonderful Thursday and have a great night! Thanks so much for stopping by. I hope you come back to visit often. I just love lots of input from folks. Real foods do taste better and these all look great! They really do, don't they? Thanks so much for stopping by. Stopping by and following from Aloha party linky. Thanks for stopping by. I hope you come back to visit often.